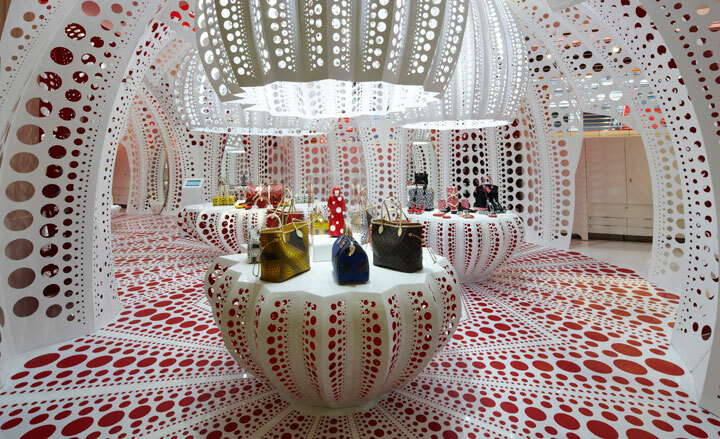 Louis Vuitton released a small ready-to-wear collection in collaboration with Yayoi Kusama in July 2012 and now they’ve extended the collaboration to a concept store in London’s Selfridges accompanied by 24 window displays. This collaboration is arguably Louis Vuitton’s smartest artistic coup to date as the vast undulating polka dot fields seem to translate so well to textile and pattern design and to Louis Vuitton’s creative thinking fusing fashion and art. Kusama calls her work “infinity nets” and sees the dots as the form of the sun, which in her words ‘is the symbol of the energy of the whole world and our living life, and also the form of the moon, which is calm. Round, soft, colorful, senseless and unknowing.’ As well as references to nature the colour pop of vibrant hues also hark back to childhood exuberance and cheerfulness.